Your conductor is not being rude, just following the rules. Courteous conductors are being told to never hold the doors open to let riders dash to a new train across platforms during rush hours. And if you're lost and in need of direction, tell it to the intercom. Conductors are now being told to point riders to blue-lit Help Points, information kiosks or other MTA station workers, to answer questions. 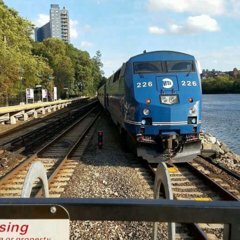 It's all part of the MTA’s effort to cut seconds from the time a train sits in a station, and to keep them flowing. One instruction tells conductors to never hold train doors open for transfers between 6 a.m. and 9 a.m., and 4 p.m. to 7 p.m. Another point instructs conductors to tell riders to ask questions to the MTA’s customer-friendly Wayfinders staff, station agents, platform workers or kiosks and intercoms. “If I ask a question, they’re always happy to oblige,” commuter Misch Enriquez told The News as she stepped onto an uptown No. 6 train at Grand Central. Justice Patterson, a Manhattan high school student at Grand Central, said he’d be annoyed to see his transferring train pull out before he can step onto the platform. But he admitted he’d be just as annoyed waiting in a station for other commuters to make their transfer. The notice against holding the doors open for rush hour transfers is a reminder to conductors, but telling confused riders to ask other MTA staff is a new instruction, according to MTA spokesman Shams Tarek. “It’s called ‘Save Safe Seconds’ to reinforce to customers and personnel alike that safety is always the top priority, even as we work to improve performance and reduce delays,” Tarek said in a statement. John Ferretti, an subway conductor and union shop steward, disagreed with the MTA, arguing that management is telling staff to speed up operations, like closing the doors as quick as possible, without emphasizing safety enough. He also thinks riders will get the shaft under the new directive. This is great. Reducing dwell times is really important. It is always the train that is in the station first that leaves last when it stays to allow passengers to transfer across the platform. I'm in agreement with this. Getting trains in and out of stations will speed up service and keep trains on time. No more holding trains for connections, this is not the Long Island Railroad. I don't have a problem with this. I think people have to start holding themselves more accountable when they're traveling. Most people have cell phones, and most of these stations have information areas with maps and the like. People are just lazy. I agree with this, but then you'll have customers writing up complaints left to write because the conductor was "rude". I also think that people take too narrow a view of dwell's impacts. When you're holding doors, you aren't just selfishly delaying a whole train. You're also affecting the system. A train that is just a few seconds late may cause delays at a tightly scheduled merge (think 36th ), or may miss its slot altogether, creating a cascading effect of unevenness and slot setbacks. Dwell is also eventually what determines capacity. If there were no stations, we could run a *lot* of trains; not stopping means you literally just run trains at braking distance and no one ever gets delayed. Thus, if we are ever to unf*ck lines like the Lex, we have to break dwell capacity spirals, which I see this memo as accomplishing. Another think that should be taken into account–especially off-peak–are the automated announcements. I have been on trains where the conductor doesn't close the doors until the announcements finish. It is only on rare occasions when they cut it off. This has to change. Pleasantly amazed by this! Not surprised it came into effect, there are moments where I need to wait upwards of 2 minutes for a train to shut it's doors after being in the station due to this, unacceptable. As for that last opinion in the text, I actually find this safer than the current system we have since trains scheduled as how they are supposed to be prevents some delays and more minor errors in the system related to signalling (which is already abysmal). Riders may be angry but the current system in place is inefficient and fragile at best for everyone else. Going to a help point isn't the worst thing ever, it isn't bad and for those in disbelief, it also isn't like that's the only option riders have anyways (MTA employees are another option too). Except this isn't in effect off peak. This is largely only during rush hours. the cynical side of me thinks this is one of the reasons why they did it. Finally, I don’t have to stick my head out to tell the stupid customer to shut up and let the train leave the station. Those minuets add up especially in the core where the most people stop conductors for directions. I tell them to talk to the intercom or find a station agent since they have no work to do anyway. My aunt retired at the right time. ....I tell them to talk to the intercom or find a station agent since they have no work to do anyway. I'm not bringing this up to be a contrarian (I've never been fond of pax on platform level approaching c/r's in that position anyway... you will never catch me doing that) , but I will say that some of those platform-level intercoms tend to be inconspicuous.... I'm inclined to believe that the vast majority of subway riders either don't know what they are, or don't know if they even work ! The intercom at 47-50th Street Rockefeller Center is atrocious. Don't see an issue. Thay's literally what Help Points are for. Emergencies should be the only reason that Conductors help. I hear Andy Byford doesn’t even like the Automated announcements on the trains. Won’t be surprised if he calls for Conductors to make manual announcements. For what? So we can go back to inaudible, garbled announcements? Exactly! But maybe this is why new potential conductors have to pass the OPA exam to be considered. I highly doubt that. If he does, he'll run against the ADA requirement for clear, audible announcements to be made in the trains and on the platforms. While there are some conductors on the older fleets that meet those requirements, there are many others that sound like they came right out of a Charlie Brown special. Besides, the whole point of the automated announcements, recent additions notwithstanding, is to give pertinent information without the myriad of different accents we have, hence the use of various radio personalities for them. If the issue is the length of the announcements, perhaps it's time to revisit that pilot program from 2015 where a / train was equipped with a new announcement system. That wasn't terrible, aside from the mix of voices in each sentence. I never understood why Charlie didnt re-record the new announcements. Maybe he wasn't available? That and he's probably retired from making announcements.